When Gattaca was first released, I was underwhelmed in a theater that was practically empty. Flash forward thirteen some odd years and I caught the film on HBO. Something finally clicked and I think it was a solid film. This momentum carried to Andrew Niccol's new film when the trailers were first released. I knew this was a can't miss since it was not only penned/ directed by Niccol (who had my new found respect as a filmmaker) but also had a pretty solid cast. Sadly, I was wrong after I read reviews and the testimonials from those closest to me. In spite of this, I still had to see it for myself and pass judgment. Needless to say, they were all spot on... In Time is not a good film. The film follows a simple premise. Through a genetic modification, humans stop aging at 25, yet are required to earn more time or they will die within a year. This means that time has replaced money as currency. In Time follows Will Salas (Justin Timberlake) as he lives practically day to day in one of the time-zones that is a slum. After a chance meeting with Henry Hamilton (Matt Bomer), Will is the recipient of Henry's one hundred plus years. Following his mother's death (Olivia Wilde), Will decides to use his new found "wealth" to wage war against the despot political system in place and redistribute time to all. 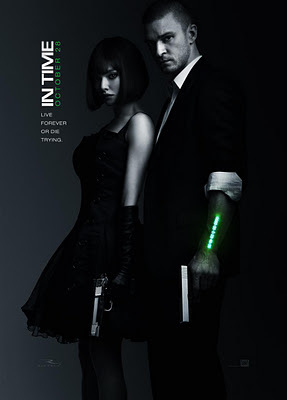 In Time seems to have a great concept if one gives it a cursory view. I disagree with this sentiment. Much like District 9 (which is a far better film), it uses a concept to simplify its message. If your characters are basically robbing banks to redistribute wealth than why must there be the time concept? The message of the film would suffice without it. In fact, it might be better off since the time element (time as currency) led to a multitude of insufferable puns and play on words. This turns into a domino effect as the weak dialogue impacted the performances of the actors. Case in point is Cillian Murphy, he tried his best but you could tell he did not have much to work with. I will say this though about the film, Roger Deakins did a decent job with the cinematography, then again he always brings his "A" game to a production. All in all, In Time is a disappointing "Robin Hood" inspired tale with a uneven story that was unnecessarily conceptualized. It is difficult to advocate a rental, one should just avoid this film.